It’s a free day today for both the travellers and more importantly the guides. News at breakfast was not a good one. Our specialized vehicle had more problems. A mechanical or engine part had burst and were awaiting spare parts to arrive. Most of my fellow travellers had planned to do skydiving. There is an assortment of things to do while in town. I choose to get intimate with the desert. A group of us end up with a guide and a FWD and headed into the desert. The trail is almost sandy all the way. It looked totally arid. I can’t imagine life surviving here. Drought resistant plants do survive here. The Dollar Bush is one. 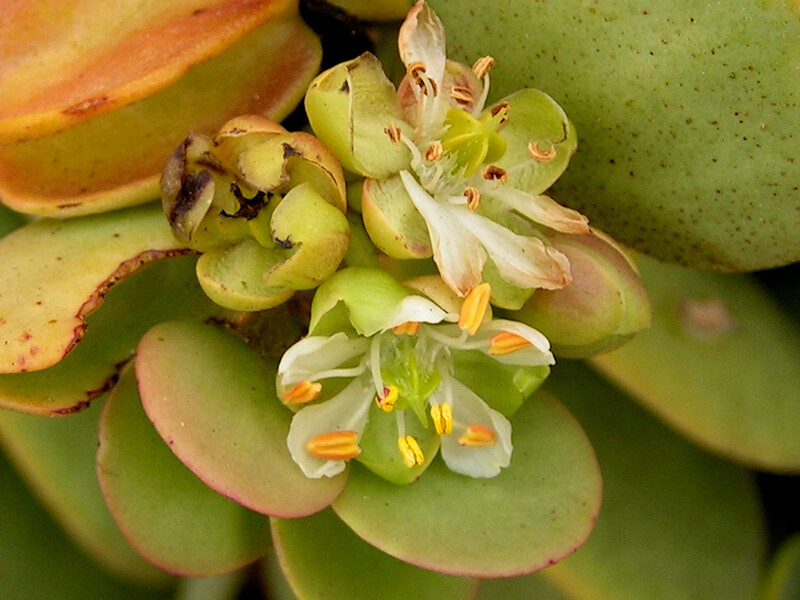 Succulent rounded leaves absorb moisture from the air. Nearby was a spindly looking plant. These plants are adapted well to this harsh environment. Rain is very little and sparse. 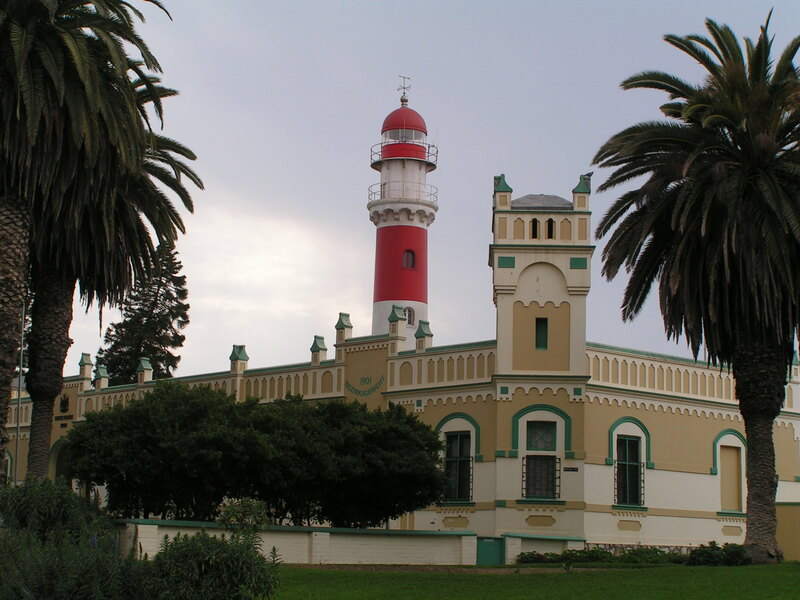 The fog created by the Benguela Current seemed like the only source for both flora and fauna. In a wide valley, the now dry Swokop River supported a variety of plants including shrubs and small trees. These plants survived by throwing deep roots to tap the underground water. The oasis in turn provided wildlife to thrive particularly birds. Along the Swokop River was a strange and bare landscape called the Moon Landscape. Soft stones had been eroded by the river leaving behind exposed layers of hard rocks. At one spot we walked around some boulder rocks. 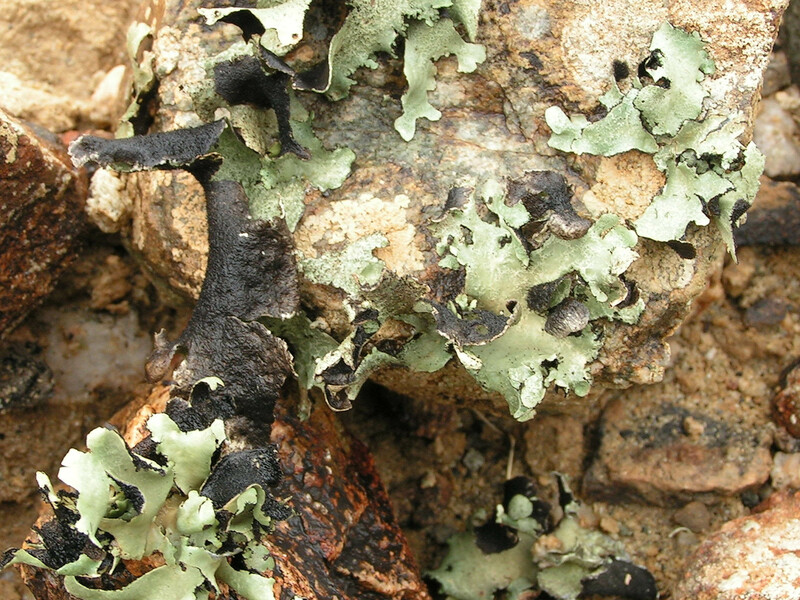 I was surprised to find black fragments of dried lichens attached to the surfaces. When water is sprinkled onto them, like magic, the foliage moved and crackling sound emerged. From shades pale green to bright green, with black under surface. Looking more closely, there seem to be many types around. The desert is not inert at all. A black ridge of dolerite formed on the backbone of the mountains stretched far. This hard rock had remained as erosion had removed the soft rocks. 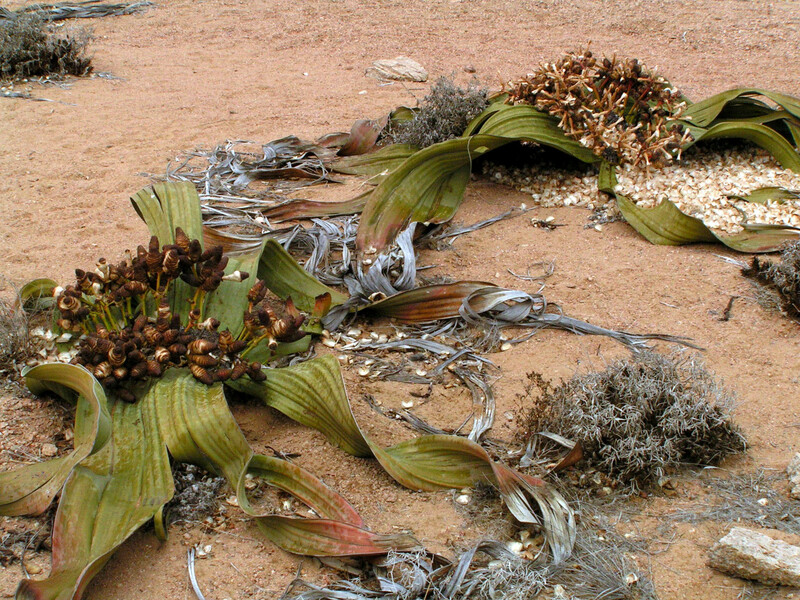 We continued further on the desert sand roads to the witness a rare plant – Welwitschia mirabilis. 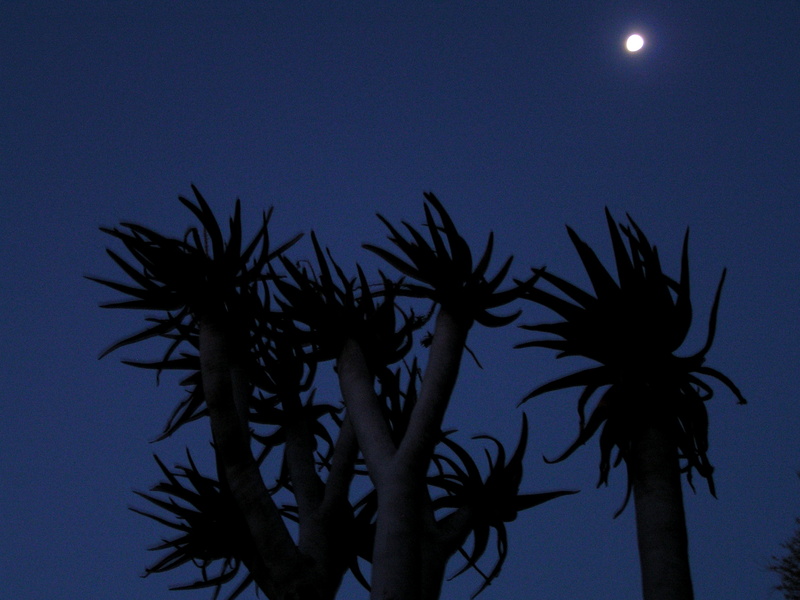 These plants are unique to the Namib. Only two leaves are produced in its entire life. As they grow they twist and curl and the edges eventually tear. Its survival is remarkable. Besides the harsh environment, man is assisting its unfortunate decimation. The male and female plants were in flower at this time. The plant also provided a home to a variety of beetles including the tok-tokkie and other colorful insects. In the open planes, wires from telegraph pole stretched to the horizon. Tiny spots of fungus covered vast areas of the arid surface . It is refreshing to witness that the harshest deserts managed to support life in a delicate environment. Back in town, I wandered along the coast and came across a group of Himba people making a living selling handicraft and souvenirs under a palm tree. The women had their bodies painted ochre and butter dye. They adorned many jewelries and the hair platted in many patterns. They had chosen to live their traditional way. 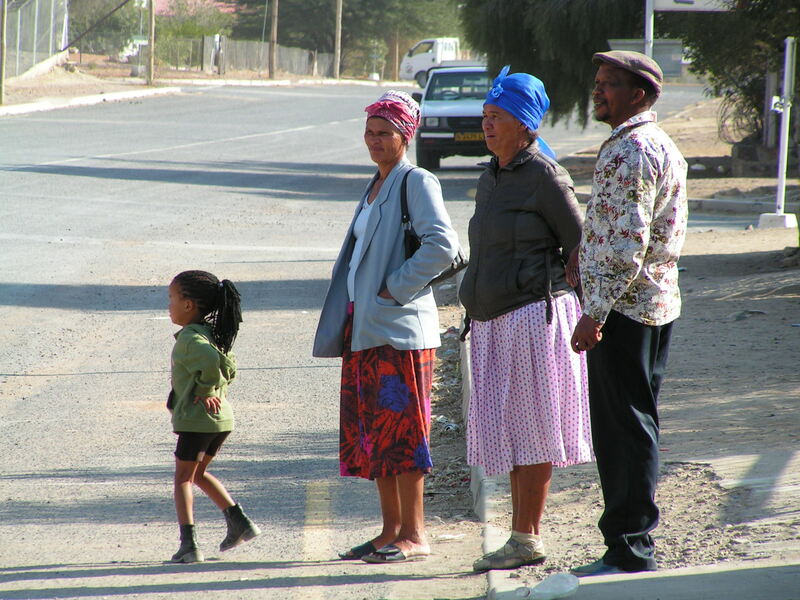 Namibia is made up many ethnic groups but all seemed get along. Nearby was another local tribal market. I met our guide Chris. The truck had not been repaired yet! Today we headed out of the heart of Namib Desert in southern Namibia towards the skeleton coast. It was a bright sunny day. The heat can be very testing. I wondered about the animals and people whom call this place home. There is some greenery but sporadically. Fiery mountains ranges seem to float above golden grasses of an arid landscape. Spotting wildlife is exhilarating. A small heard of wildebeest foraged on the short grasses. Some distance away, a decent herd of Springbok nervously looked at the passing vehicle. It is simply amazing to see animals live in a natural environment without fences or borders. With the vehicle bouncing rapidly on the unpaved hot desert roads, one window shattered. Chris managed to get a spare attached. However, it continually dislodged just after several kilometres. The red dust spewed into the vehicle. There was some discontent. At the last breakdown, I mentioned to Chris that I had a duct tape in my pack. This incident had already slowed us down by an hour. All the baggage was removed from the truck and managed to get my tape. This was perhaps our last hope. Thankfully it held. Never leave home without a duct tape. 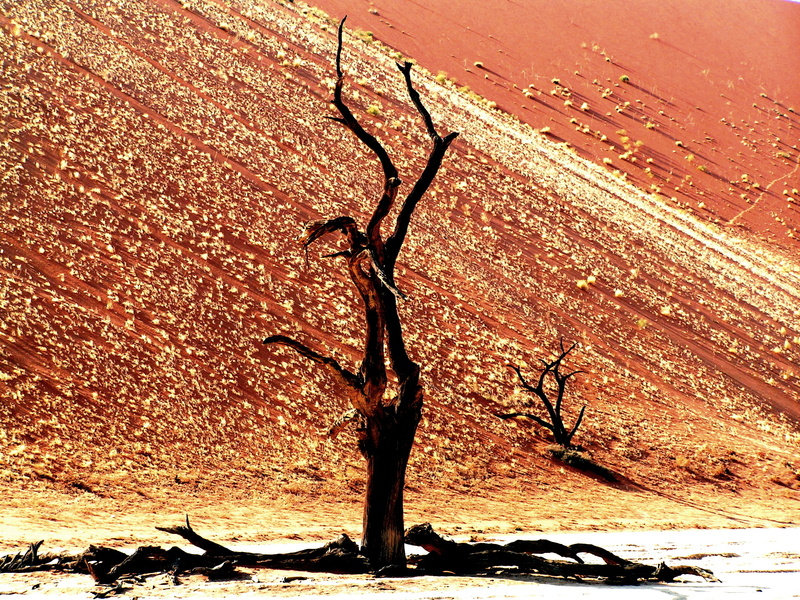 To survive in the Namib is astonishing. The human endurance is equally amazing. Small outpost like settlement dotted the desert roads providing essential lifeline to travellers – fuel, restocking food supplies and repairs and maintenance. Solitaire was such a town. It looked desolate. Shells of cars lay rusted in the compound. However, the high point here is the best place to sample apple pie in these parts of the world. A bakery dished out some hot steaming pies and other delights. It was a real treat. We had reached the imaginary line of the Tropic of Capricorn. Under a blazing afternoon sun, we stood at the signage like we had discovered a new country. It was satisfying just knowing. The trail continued pass dried riverbeds at Gaub and Kuiseb pass. Deep rooted trees survived. These are desolate places of rugged hill and canyons. Winding through, we finally reached a paved road. The noise of the tyres against the unpaved roads of the desert became silent. A loud bang brought the vehicle to a stop. We had a flat tyre. This is the fact about travelling in the wild. We joked; the tyres couldn’t handle the wonderful smooth paved roads after days in the bouncy desert roads. Monumental sand dunes, a railway track and a nearby airport kept us company. 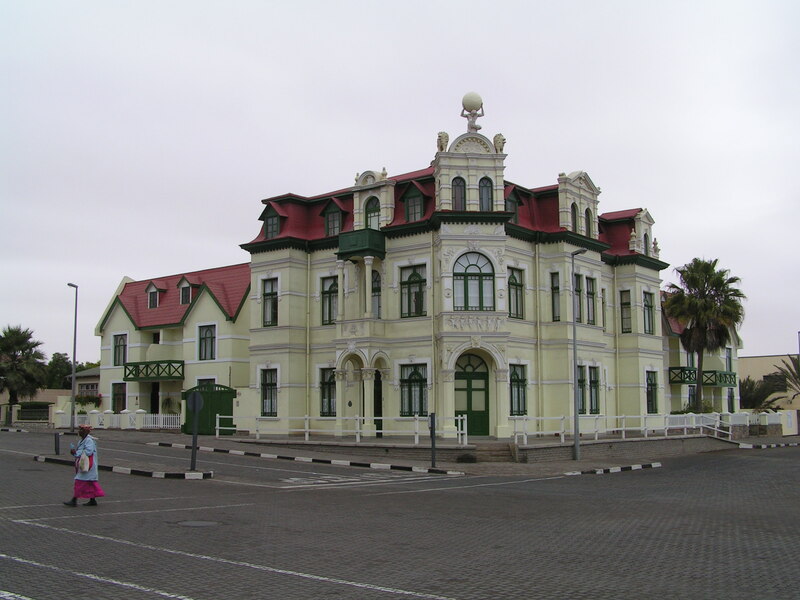 With the tyres fixed, we reached Walvis Bay on the Atlantic coast in the late afternoon. A decent sized town at last. The views of water, although gray, were soothing. 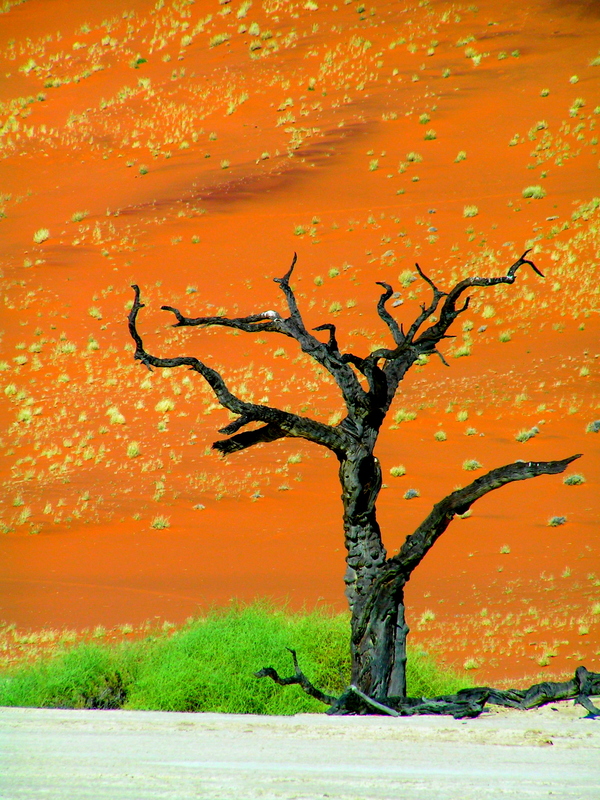 Namib is fascinating, colourful and although arid is certainly alive in many ways. Lesser flamingos feed in the shallow waters at Pelican Point surrounded by manicured gardens, modern housing and a thriving port. On the fringes of town, the in avertable advance of the reddish desert sand lay several feet high against the barrier walls of houses. After lunch, we headed into Central Namibia to Swopkomund. 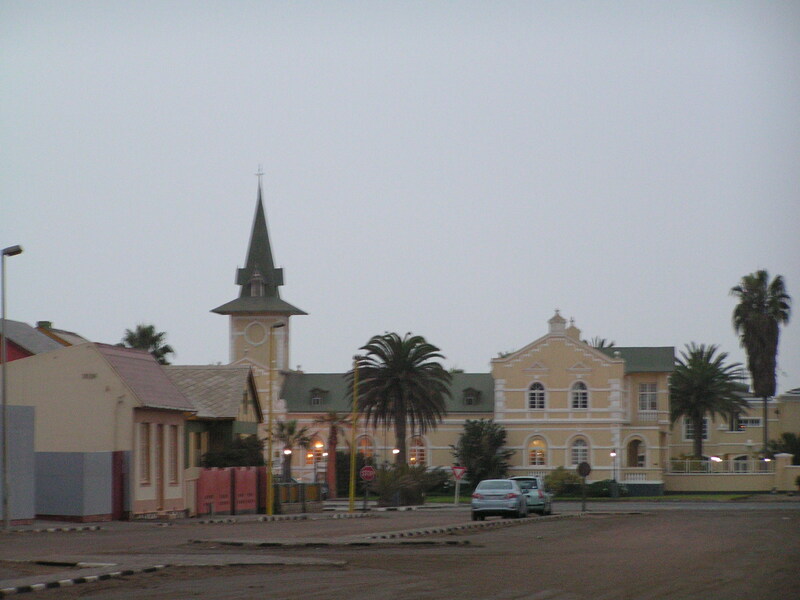 The town is surrounded by the desert on one side and the Atlantic on the other. 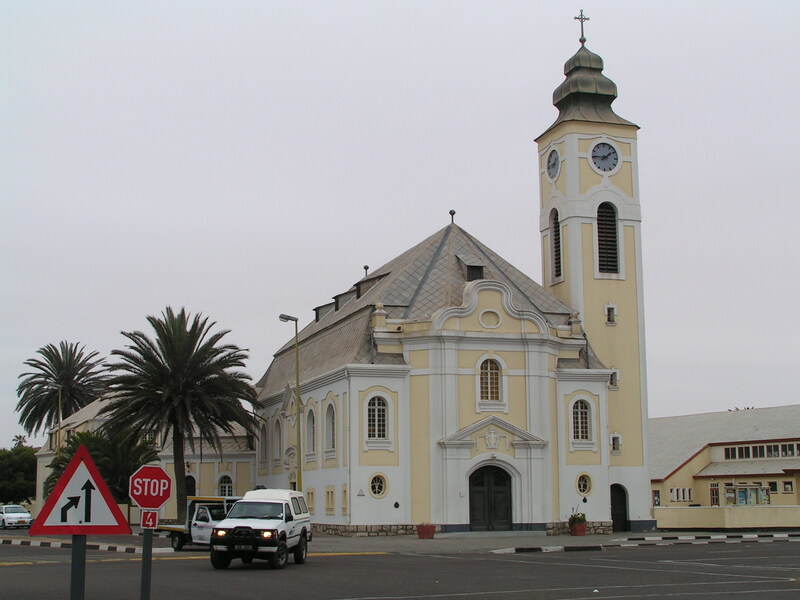 It is Namibia’s premier beach resort and has a unique German colonial architecture. Palm lined trees, neat wide clean roads, street markets, a promenade along the beach and colourful architecture greeted us. All the trimmings of comfort awaited us at a hotel. 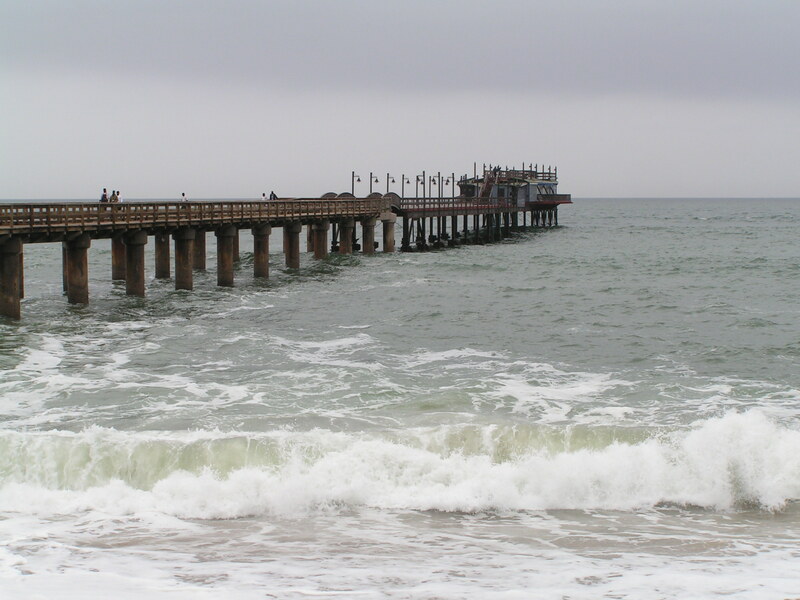 A group of us headed off to a restaurant on the jetty dining of fresh seafood with the waves crashing against the concrete pillars and the long sandy beach. The proximity of the desert, the heat and dust had faded away for now. We were up early, before sunrise. It was a relief that we were to spend another day here at Sesriem. No dismantling of the tent. The park gate opened at around 5am. There was already a queue of vehicles ready to enter the park. Once in the park, it seemed like a race on the desert roads to reach ones destination. Chris was good and relaxed. I had confidence in his driving skills. We were at Dune 45. Although dark, it was a colossal, over 150m high. It resembled a pyramid and looked formidable. Some trekkers were already walking on its winding spine. The sand was loose. It was still cold. On the eastern horizon, the sun was rising. From the top of the sand dune I witnessed an amazing scene unfold. Two life giving force, light and water from opposite directions, diffused at the base of Dune 45. The first light on my face was comforting. Sunlight from the east filtered through warming the land. On the western horizon, a low dense moisture laden mist gracefully move inland brought in by the Benguela Current from the coast off the Atlantic. 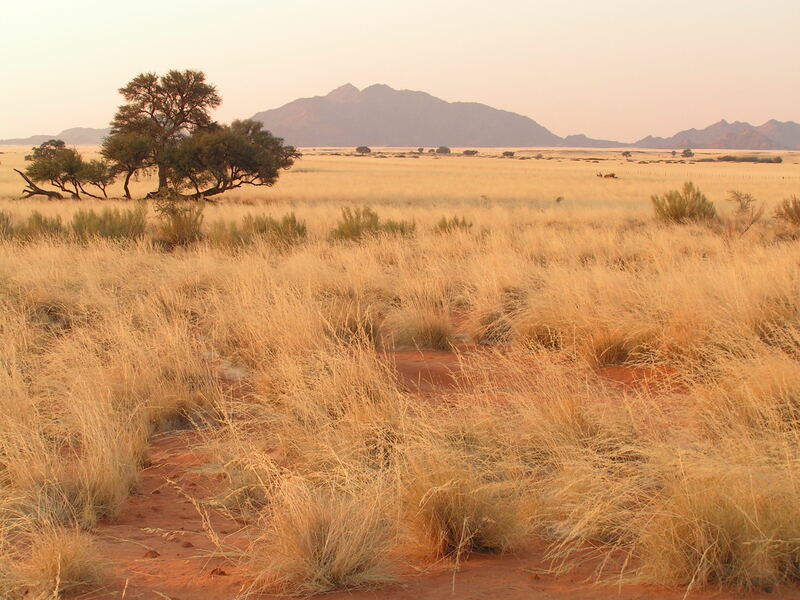 The dune’s surface took on a deep reddish glow and the tough short grasses on the desert floor illuminated a golden hue. 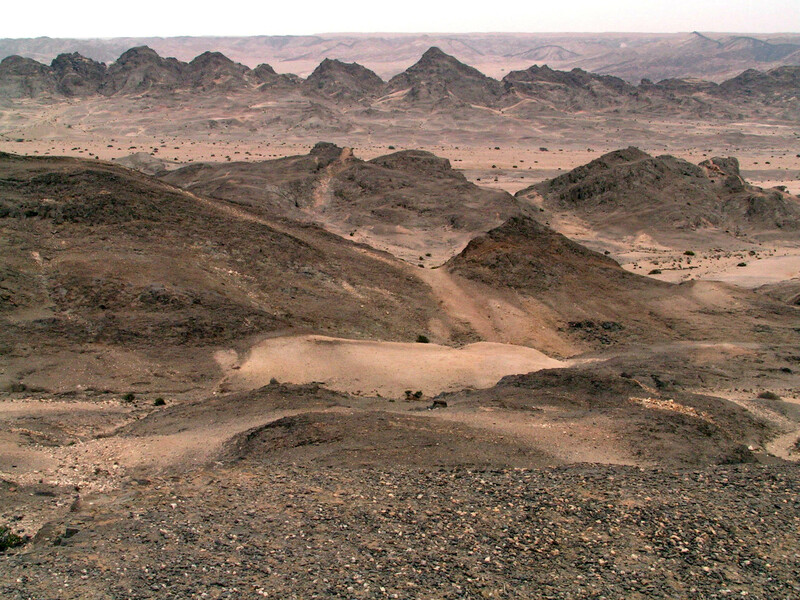 The western slopes of the surrounding dunes were darkened in contrast. It was a surreal and wonderful spectacle. 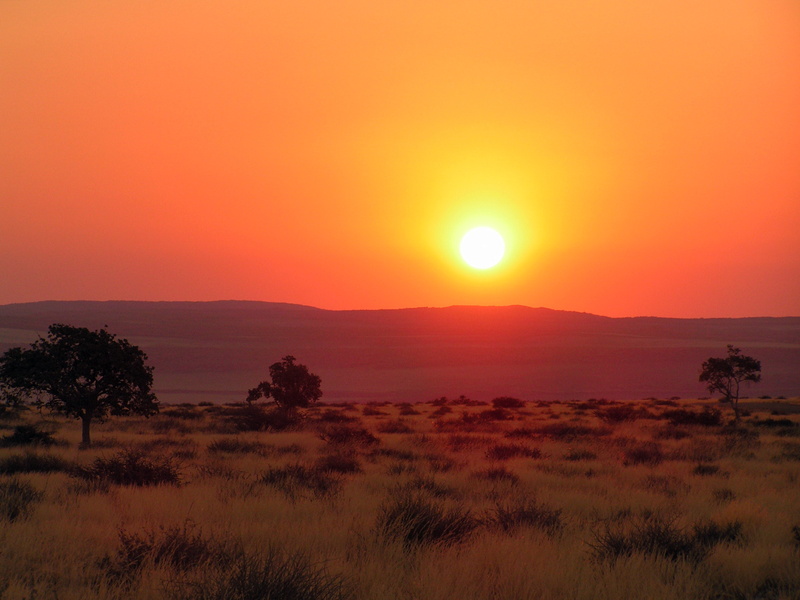 The mist continued further inland as the rising light transformed the inert desert sand into beautiful and unearthly colours – mainly hues of red, orange and gold. Trekkers snaked up the length of this dune crescent’s spine and silently watched nature’s gifts to this unforgiving environment. As daylight emerged, the contours now more defined had myriad of patterns and form. Numerous other high dunes appeared all over. Some looked much higher. The desert stretched endlessly. Dune 45 continued further and curved inwards and outwards resembling a mountain than a dune. Here, nature is continually redesigning this extraordinary landscape. 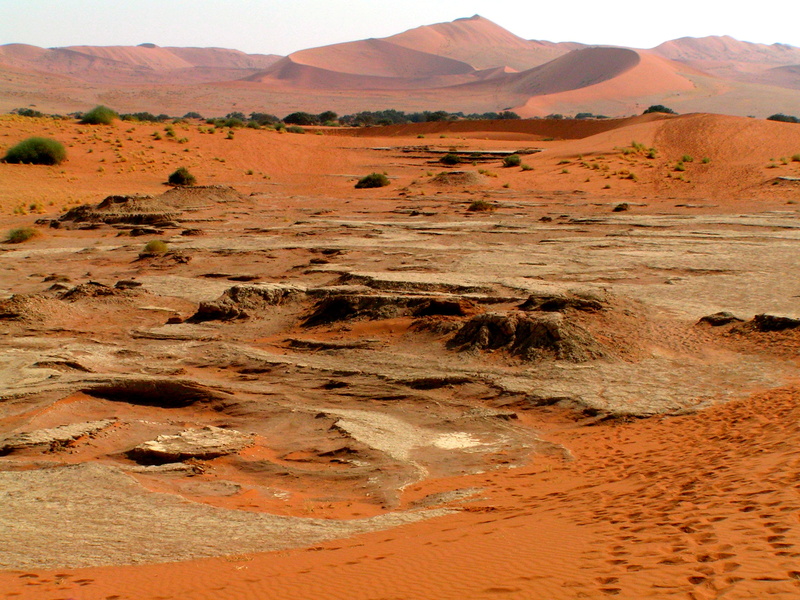 The sand deposited here in the Namib originated from the Kalahari Desert. 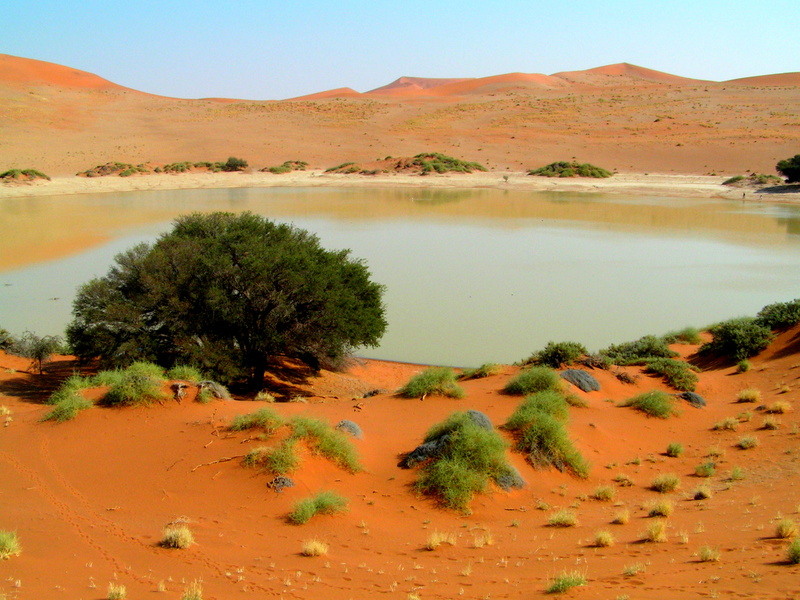 The Orange River that meanders through Kalahari deposited the sand at its mouth on the Atlantic coast. From here, the Benguela Current carried the sediments north and the winds helped to deposit this sand inland into the Namib Desert. Only on the decent did I realize the steepness of the dune. However, it is much easier on the decent that on the accent especially with the cold air. 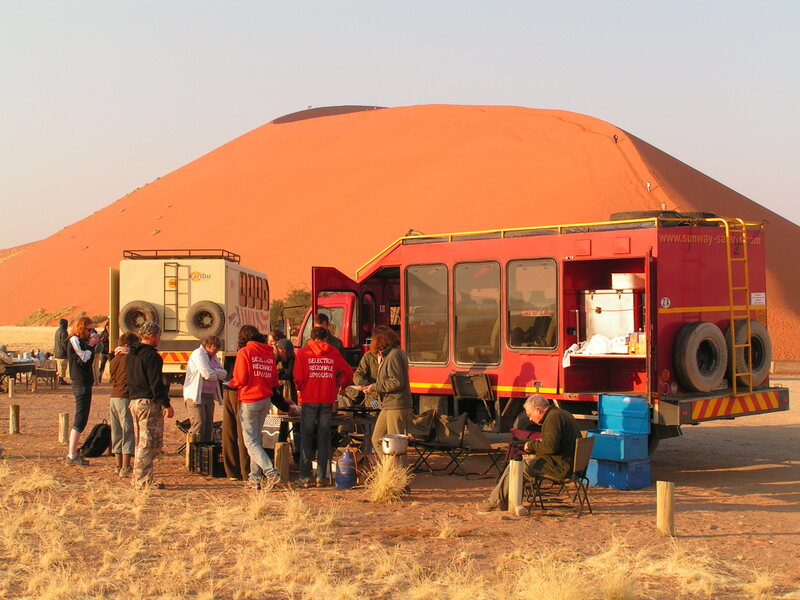 A nice hot breakfast waited at the base of Dune 45. Crows lingered nearby on a leave-less tree scavenging for food. 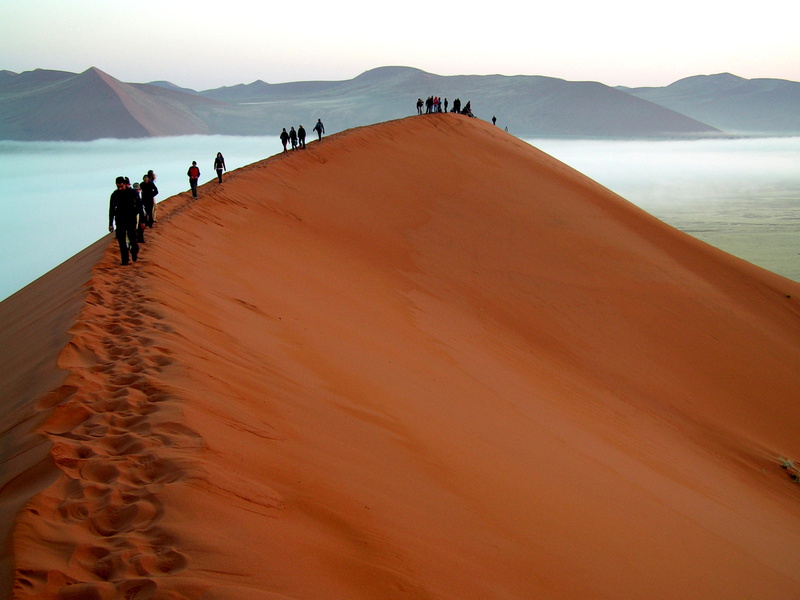 On the valley floor, perhaps a dried river bed, I was surrounded by towering dunes of varying forms. Not all are crescent shaped. The shape is carved by the direction of the wind. 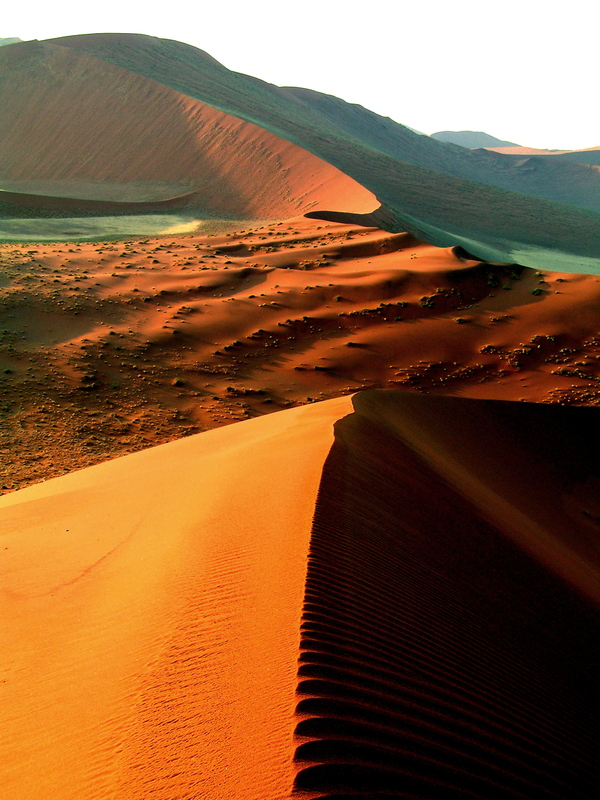 Namib Desert is considered as the oldest desert in the world. Our vehicle left behind a trail of desert dust. We reached a parking area. 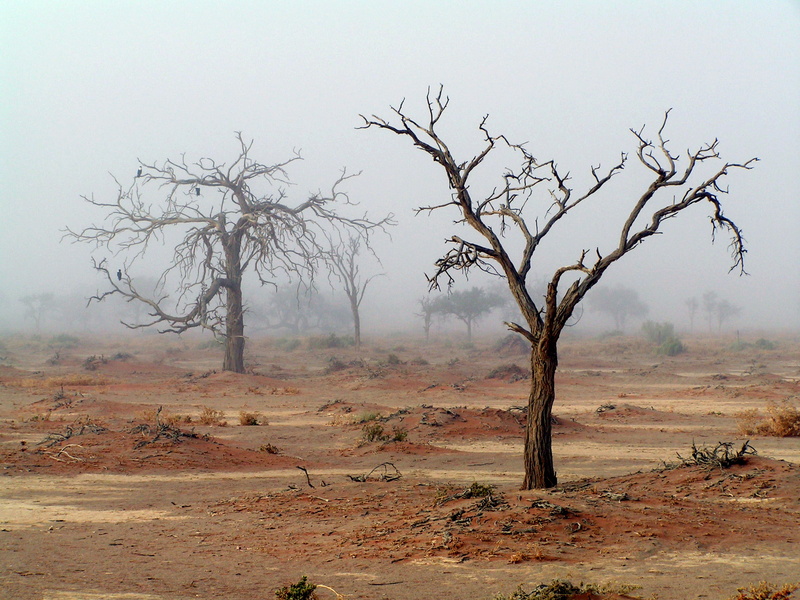 The sight of lifeless trees but standing covered in mist was quite eerie. 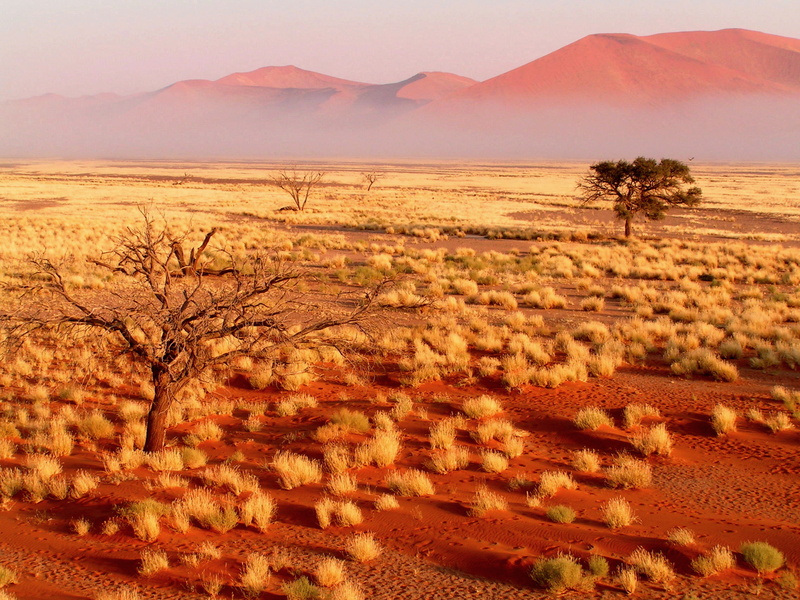 This is Sossusvlei. From here, we jumped onto a tractor. 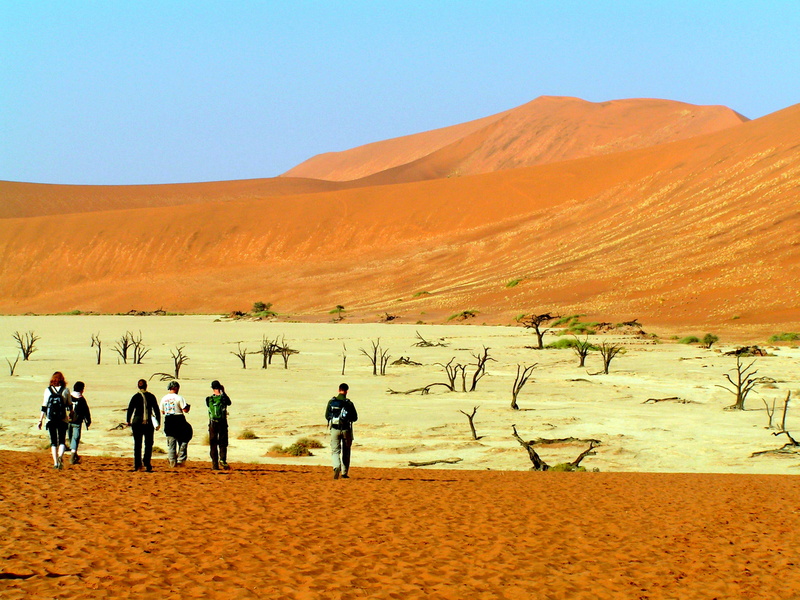 A short walk past some hardy Inara plants with ball like fruits, we reached Deadvlei – Dead valley. From a distant, the elliptical shaped white salt pan with blackened lifeless trees looked unreal. It was massive. 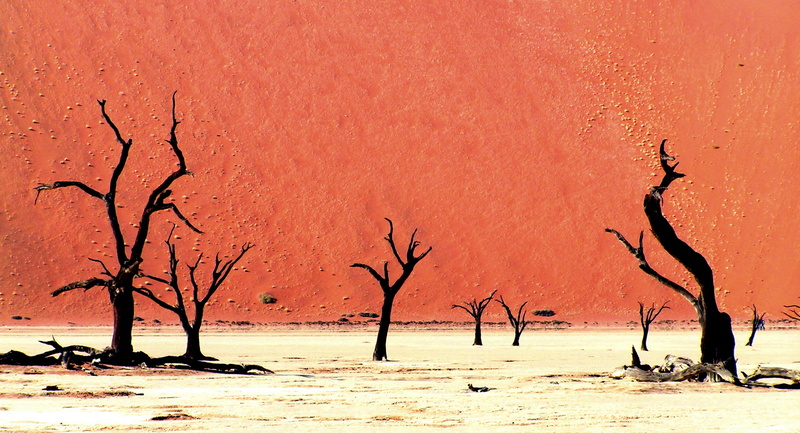 The white salt pan floor, the charred upright branched trees and flanked by monumental orange and red dunes was surreal. The nearest, Big Daddy is over 300m high. Shadows emerged and the colours of the background dunes and pan floor also changed with the light. 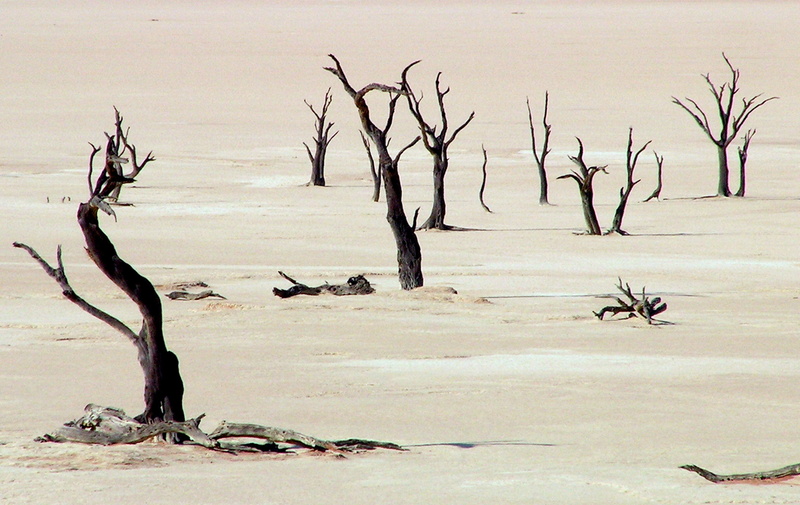 It is remarkable how these trees had once survived in this oasis. The Tsauchab River that once flowered here is now blocked by the advancing dunes. On rare occasion, apparently there is water here. The Acacia or Camel Thorn trees are over 800 years old. They are chard from the unrelenting sun and preserved by the dry desert air. Patterns formed on the clay’s crust. Although picturesque, I was saddened by the fate of these trees. Green shrubs survived from the little moisture from the air and probably ground water. Nearby is another valley. Although the dunes here were smaller in comparison, the pan here held water. A lone lesser flamingo fed undisturbed. Acacia and small shrubs thrived in this area. Lizards moved quickly across the red sand. It was amazing to see water in this arid desert where rain is almost no existent. Groundwater seeped from underground. Green trees and shrubs, a sight for sore eyes, survived in this uncompromising environment. This is certainly a life giving place for the small but thriving wildlife including Oryx and Leopard. 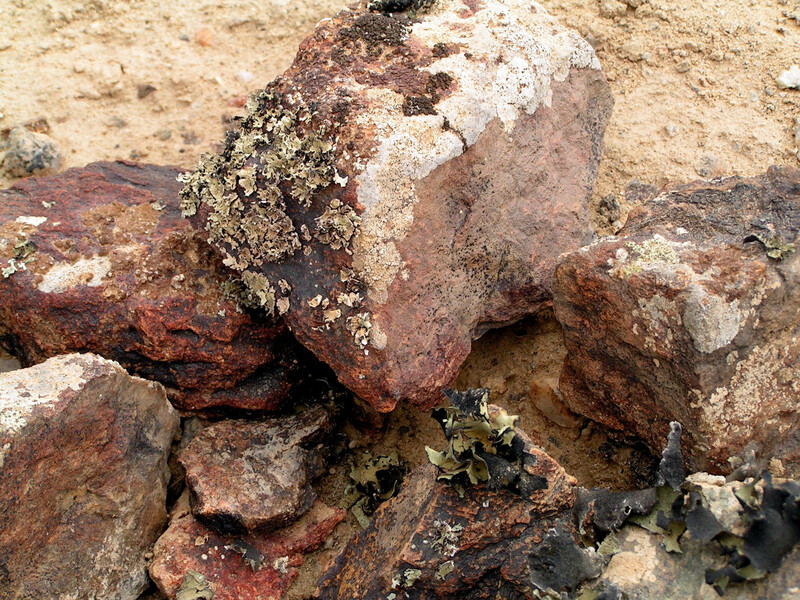 All plants and animals in this desert lived on the edge of death. 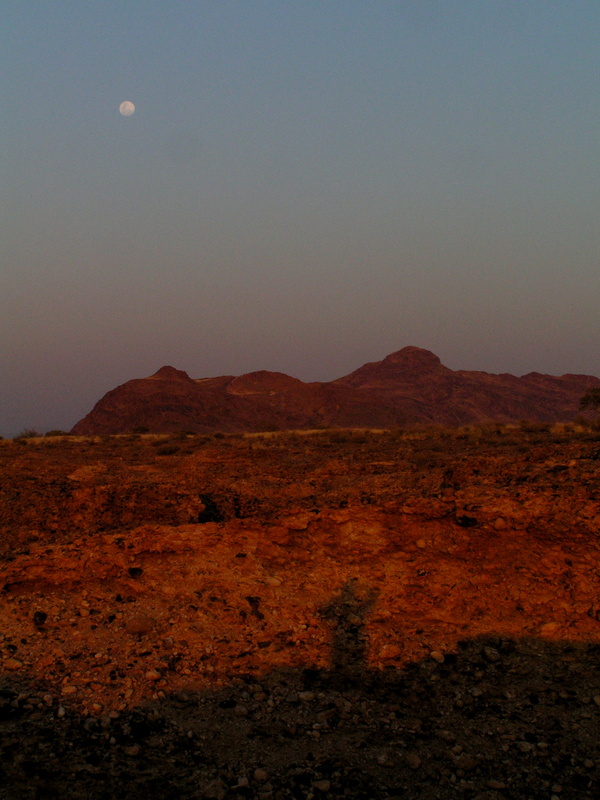 We left Sossusvlei and headed back to Sesriem camp towards Sesriem Canyon. It was late in the afternoon. 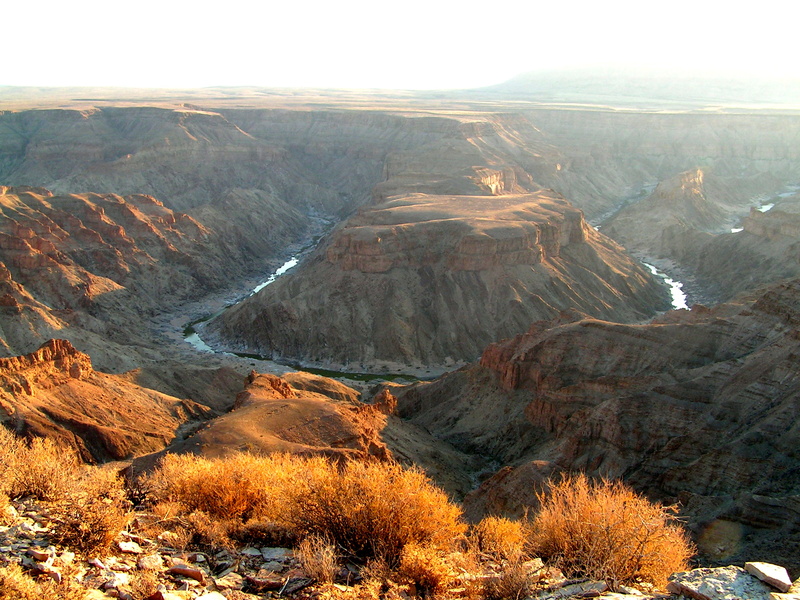 At the edge of this rocky land, I could see part of the canyon deep below carved out by the now dry Tsauchab River. Sesriem in Afrikaans means “six belts”. 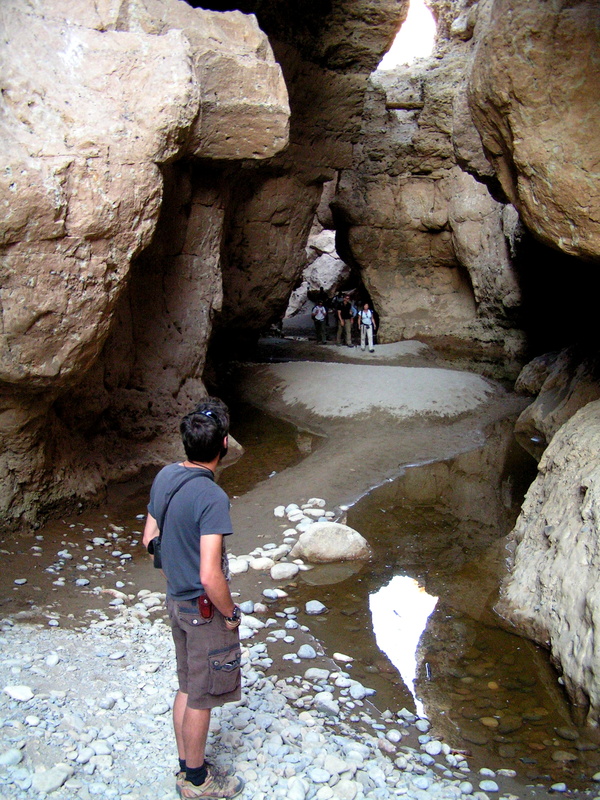 In those days, trekkers would tie up six belts of oryx hides and lower it with a bucket to fetch water from the canyon. The canyon sedimentary walls were about 30m deep in places. Pools of water remained in the winding canyon. Trees enjoyed moisture from underground water in this cool environment. The sun was setting fast. Simultaneously, a full moon was rising in the east. 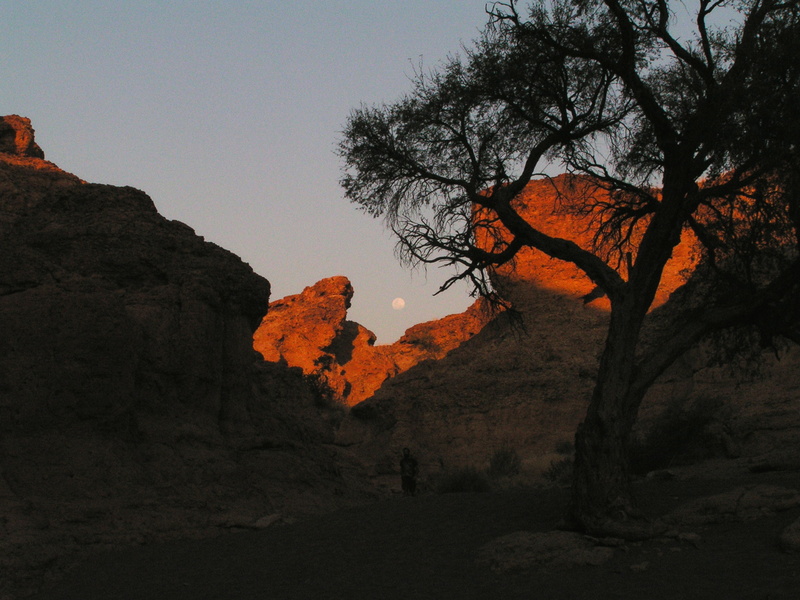 The late evening glow of the canyon walls was quite magical casting shadows and glowing surfaces. 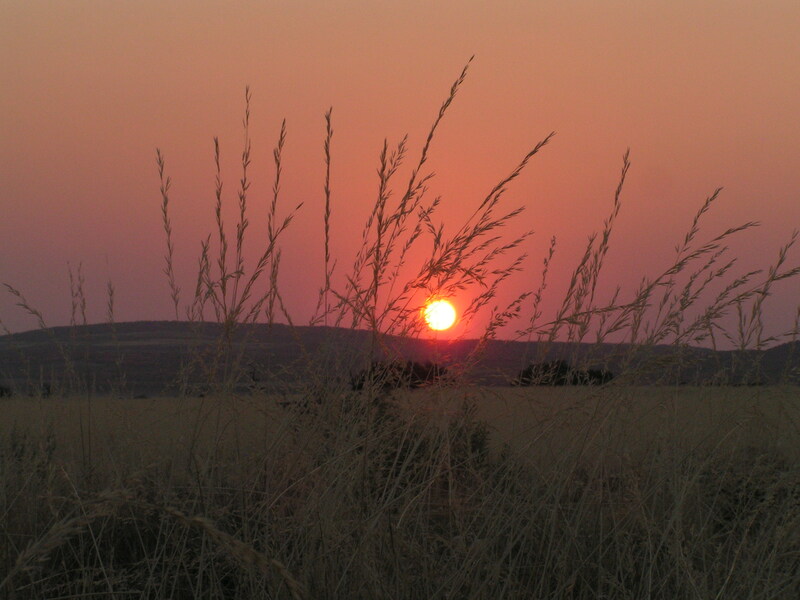 The fiery red sun set behind sandstone mountains across a grassy plain. The bright full moon rose from the eastern horizon. Time to head back to camp. It was chilly this morning as I dismantled my tent. I could smell coffee nearby. Dishes need to be done, tables dismantled and folded, waste collected and disposed. Getting all the gear packed and stacked into the truck is now more organised. This overland journey is participation camping . All participants chip in to do the daily chores. Alliances are formed by the way individuals contribute! Seating in the transport is random to ensure no preferences are given. Getting along over the next 20 days will be determined by the give and take attitude. Unfortunately some take a little more than others. Group travelling is such. A small group helps. From the southern Namib desert, we head north. 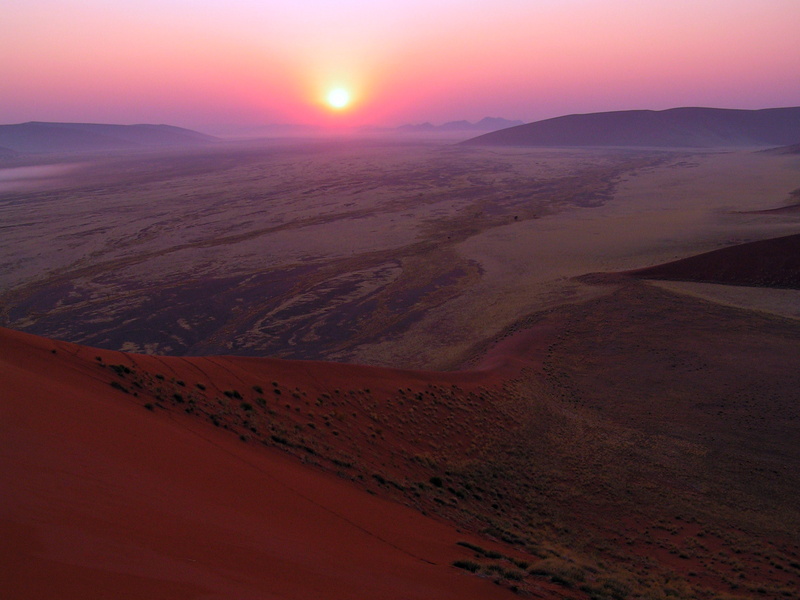 Namib desert is the oldest desert in the world. As the journey continued on gravel roads, the landscape continually evolved. 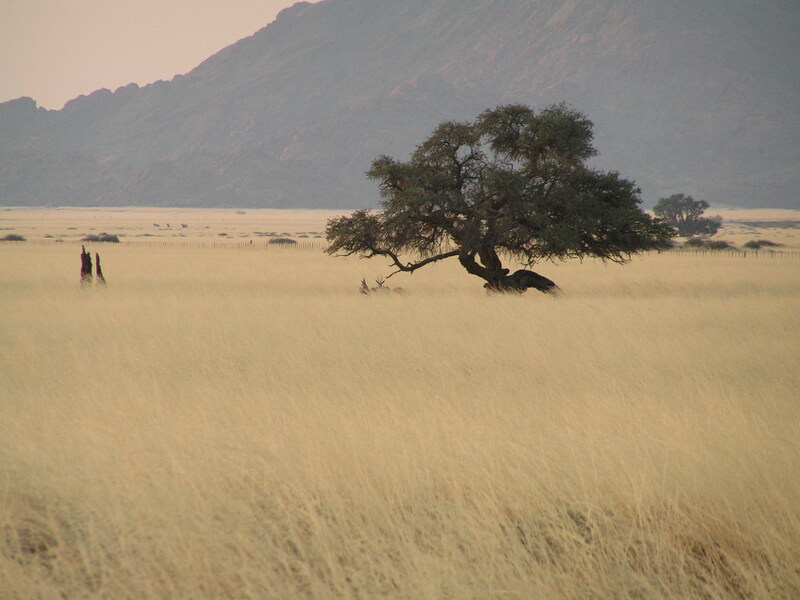 The barren landscape is dotted with the tough Acacia and Camel thorn trees and at time large tracts of golden tall grasses. Occasionally, reddish mountains just floated on the flat surface. The heat from the African sun was unrelenting. The dust churned by the moving vehicle is blinding at times. The heat from above and the dust from within can be challenging in a “sealed” truck. The desert is beautiful with varying shades of colors, forms and the shifting light. The sky was now laden with puffy clouds. Amongst the tall golden grasses, a handsome herd of Oryx grassed. I was excited to see wildlife as it was meant to be. We passed through several towns. It was interesting to see the wilderness and suddenly small communities in-between. The ethnicity also varied between these townships. After a long ride, we reached our campsite, just outside the park, at Sesserim. A tidy place with a bar, pool and some cottage huts nearby. It looks like the desert town to be. At the bar, I savored sweet ice-cold ice cream. It melted rapidly into my throat. Bliss. Later, I wandered into the nearby grassland with the odd camel thorn trees. Springbok fed on the grasses nearby ubder the shade of a tree. My eysight was peeled in expectation to spot a leopard. Wishful thinking perhaps. The bright reddish African sun was already setting. The distant hills took on a red hue and soon were just silhouettes on the horizon. I stumbled back into camp. 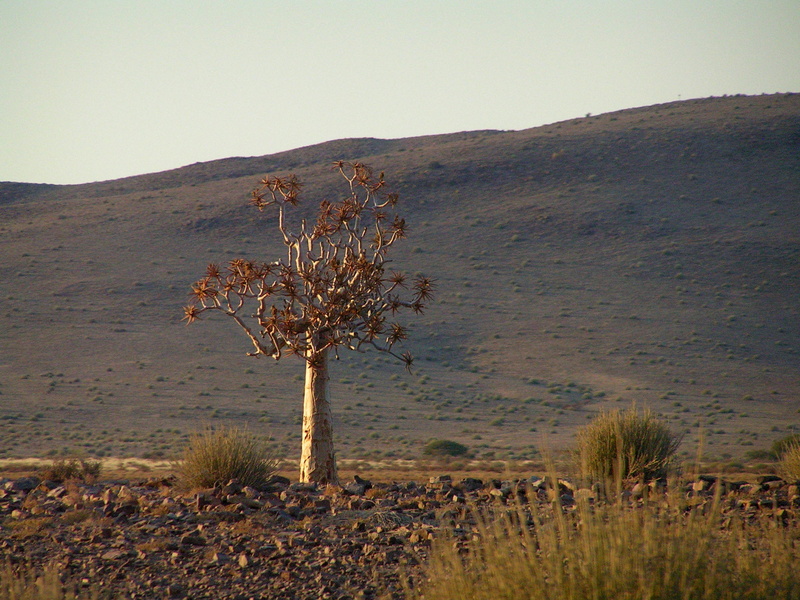 After leaving Orange River, the landscape became more arid. Grasses replaced the shrubs. The sun’s intensity increased. Sealed roads gave way to gravel. Surrounded by dust became a norm. A train track in the middle of a desolate landscape led towards the coastal town of Luderith, an old German township. Lonely telephone poles buried in red desert sand linked these remote areas to the outside world. I was excited to witness a small number of Oryx or Gemsbok, the national animal symbol of Namibia, roam in the unforgiving place. Tall hardy grasses replaced the sparse trees. Occasionally, a herd of nimble Springboks wandered foraging on the meager grasses. 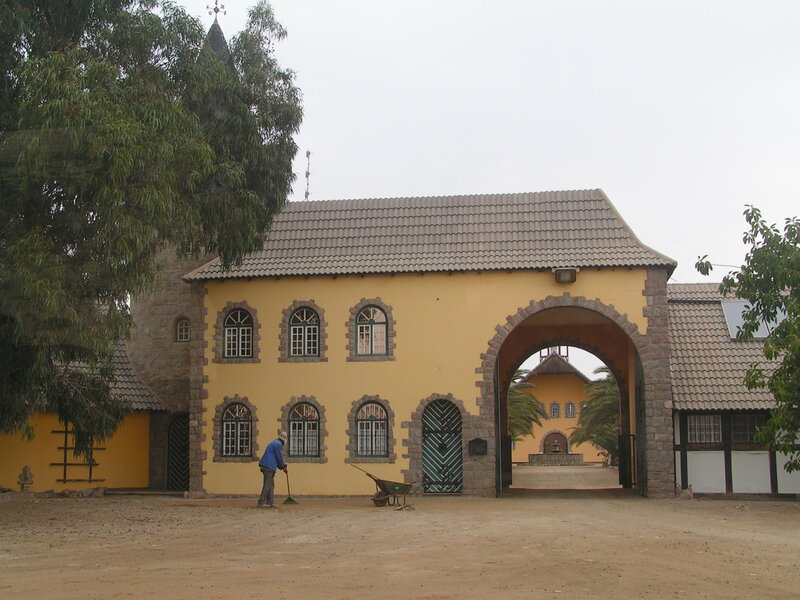 After a long hot drive, we arrived at the camp site near Hobas, the first sight of habitation. We immediately departed towards the canyon viewpoints. The second largest canyon in the world was striking and impressive – the magnitude, the colours of the rocks and the deeply gauged out depth of the canyon. Emerald green pockets of water remained deep in the canyon floor. Hardy drought resistant grasses survived. The colours were vivid. 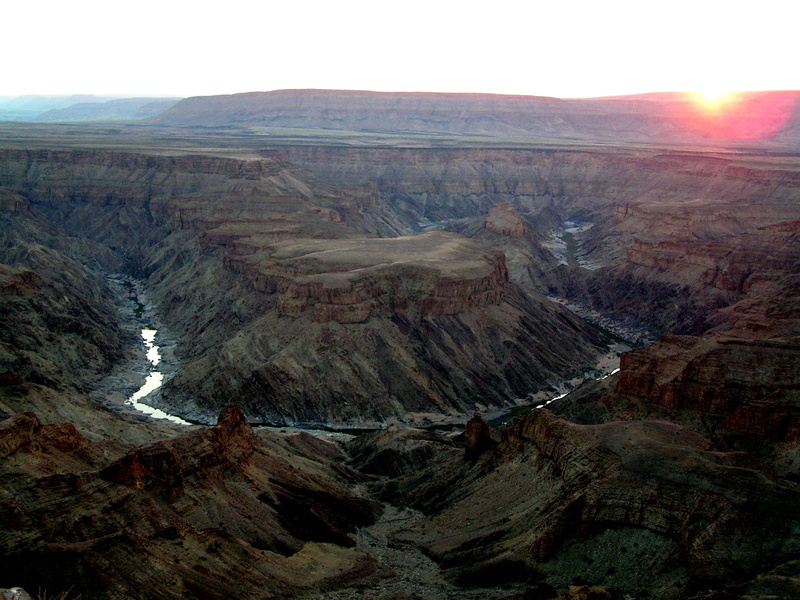 The sun was setting rapidly and the canyon wall darkened in contrast. The golden grasses were illuminated and the mineral rock surfaces sparkled. From the viewpoint, it was a steep decent towards the canyon floor. The contours, the ruggedness, the remoteness add an aura of wilderness. Finally the orange sun set behind the canyon wall. The structural quiver trees stood upright in this uncompromising and rocky domain. A couple of Black-backed Jackal scavenged the arid rocky surface for their next meal. It was dark by the time we reached camp. The moon appeared on the opposite horizon against a darkened blue sky. It was chilly that night. I slept well and got up early. We left early after breakfast. The journey wound around the mountains and out. The day was hot and dry. The ride in the purpose-built truck was reasonably comfortable. The landscape is semi-arid. From mid-August to September, this land will transform into a meadow of wild flowers. Some were already showing. The mid-day temperatures soared. 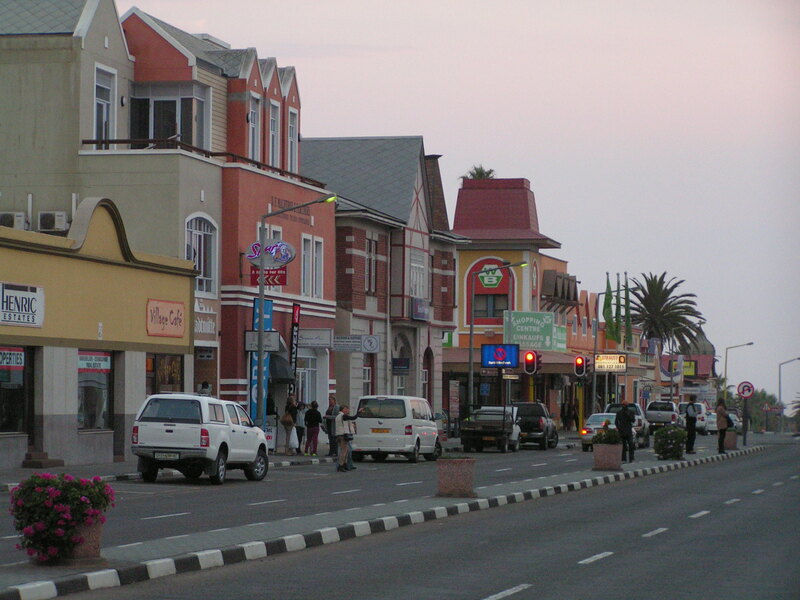 In the middle of this vast dry region, the residents of the lively township of Springbok were busy shopping. They queued at the cashier counters with trolley loads of provisions and sundries. It is the month’s end and wages had just been paid out. This is the land of the Khoisan. Finally we arrived at the northern South African border town of Vioolsdrif. There were hardly any public transport or local population. Queues of overland trucks lined up for the formalities. Strangely, we were asked to give the serial numbers of our cameras. We diligently did. 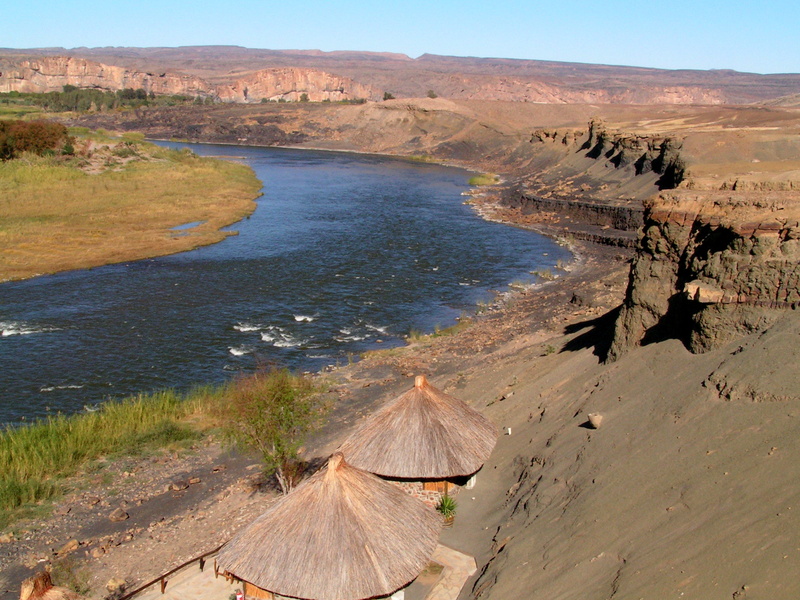 Finally, we crossed across the Orange River into Noordoewer, the southern border town in Namibia. 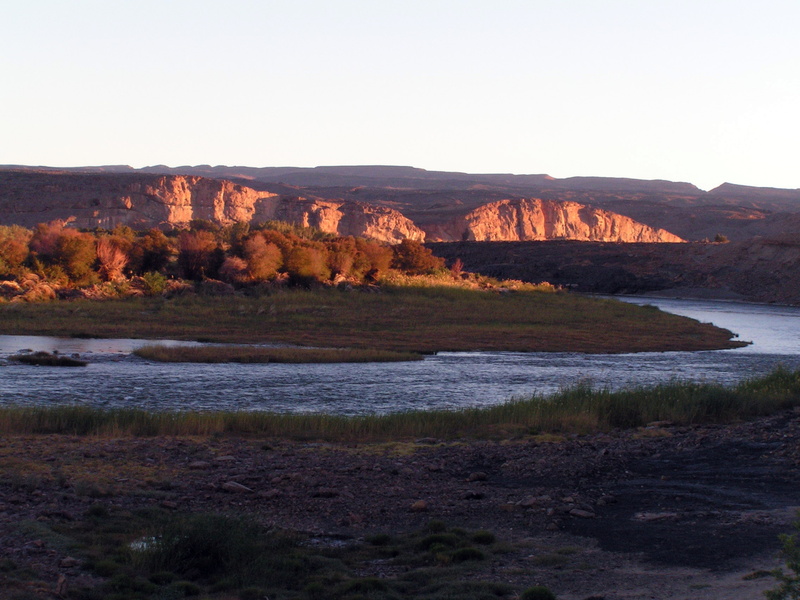 Our campsite was next to the Orange River. Vegetation along the river was lush but beyond that, barren hill. Birds prospered with seeds from tall grasses and flowering plants. 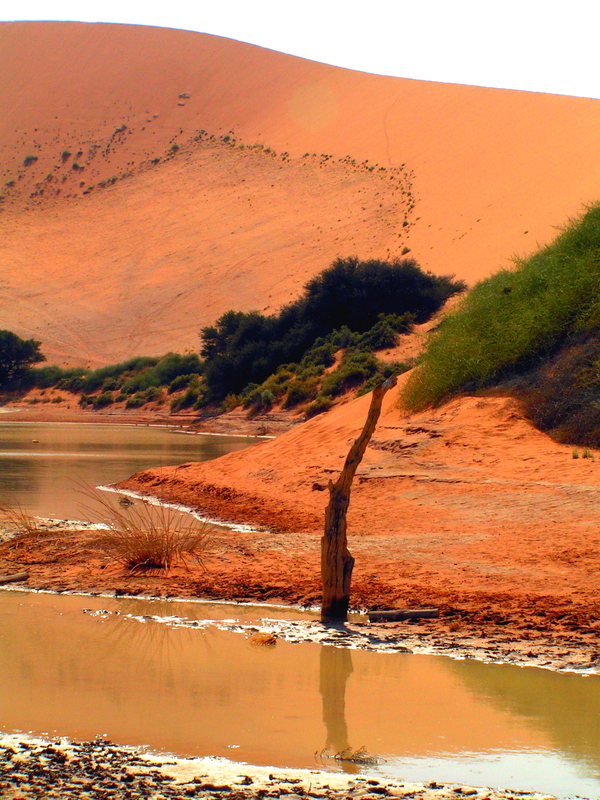 The Orange or sometimes reffered as Gariep River flows partly through southern Kalahari bringing with it tons of red desert sand and eventually depositing it on the Atlantic coast. This campsite is a good place to relax and revitalise. Rafting is a popular sport around here.